What Are Irrevocable Trusts–and Why Would I Need One? Whenever you hear estate planning lawyers talk about trusts, they are generally referring to “revocable” trusts. That is, a trust that can be modified or revoked at any time by the settlor, i.e. the person who makes the trust in the first place. Revocable trusts generally serve one critical purpose: to keep the settlor’s assets out of probate. Under Florida law, a probate estate–that is, the assets passing under your will–do not include any property that you placed into a revocable trust during your lifetime. In theory, this means you could die without leaving any probate estate at all. But what a revocable trust will not do is shield your assets from creditors or tax liability. This is because a revocable trust remains completely under your control while you are still alive. So if a creditor obtains a $50,000 judgment against you, they can go after your revocable trust. Similarly, any assets you place into a trust are still considered part of your taxable estate by the IRS for purposes of calculating federal gift and estate taxes. If you want to fully protect your assets from creditors, you should instead consider creating an irrevocable trust. This is exactly what it sounds like: a trust that you cannot amend or revoke once it is created. In effect, you are making a gift of certain assets to a third-party trustee, who then has full control over the property, subject to the terms outlined in the trust document. There are many different kinds of irrevocable trusts, each of which serves a particular function. For example, if you have (or wish to purchase) a life insurance policy, you can create an irrevocable life insurance trust (ILIT). 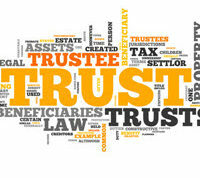 Essentially, you fund the trust by purchasing an insurance policy and giving it to the trustee. Since you no longer have any control over the policy, it would not be considered part of your taxable estate, and your creditors could not seek to collect against the policy’s proceeds after your death. Other kinds of irrevocable trusts are designed to minimize the amount of assets under a person’s control for purposes of maintaining eligibility for certain public benefit programs. For example, if you receive Florida Medicaid benefits to pay for your long-term nursing care, your income cannot exceed a certain statutory cap each month. To get around this cap, you can place any excess income into a Qualified Income Trust, which is an irrevocable trust. Irrevocable trusts are significantly more complicated than the typical revocable trust. They are not something you should attempt to do on your own without qualified legal advice. The experienced Fort Myers estate planning attorneys at the Kuhn Law Firm, P.A., can sit down with you and help determine whether an irrevocable trust is appropriate for your situation. Call us today at 239-333-4529 to schedule a free consultation with a member of our estate planning team.